In 1839, the New Zealand Company offered land for sale to the public. The land in the Wellington area was sub-divided by the New Zealand Company into 100 acre sections. Section 23 and Section 24 are the Sections commonly associated with the history of The Halfway and the Halfway House. In 1843, Section 24 was sub-divided into smaller blocks ranging in size between five and ten acres. Anthony and Susannah Wall family provided accommodation and food for people resting on their journey halfway between the settlements of Wellington and Porirua. Their home, on Section 24, became known as The Halfway House. Book - Kay Barbara and Robin Kay, 1996. Anthony Wall, Settler of Porirua: The Papakowhai Story. Fielding: Organising Committee for the Wall Family 150th Reunion. John Lodge and his wife and two children arrived by the first ship, The Aurora, on 22 January 1840. John Lodge is issued with the first “bush licence” at The Halfway. Bush licences were issued for the sale of liquor without any rules for accommodation. Book - Kay Barbara and Robin Kay, 1996. Anthony Wall, Settler of Porirua: The Papakowhai Story. Fielding: Organising Committee for the Wall Family 150th Reunion p39. Map reference to The Surveyors Arms in The Halfway locality. Book - Carman Arthur H, 1982 (reprint) Tawa Flat and the Old Porirua Road, 1840-1955 p74. Editor note: Barbara and Robin Kay do not support the theory that "The Surveyor's Arms" is also the Wall's Halfway House. John Lodge sells out to Captain William Barnard Rhodes in 1845. Anthony Wall takes over the bush licence for one year. A pen sketch of the Wall’s house was drawn by Martha King in 1849 and is held in the Wall collection at the Alexander Turnbull Library. Its caption reads “House we halted Halfway to Pororua August 28, 1849”. Walls move to Paremata (now known as Papakowhai). John McKain obtains a "Special Publican's License in 1849 followed by a "bush license" a year later. McKain provides accommodation and a regular coaching stop at The Halfway where horses are changed on the journey. "The first licencee was John Ward McKain, who held a Bush Licence from May 1849 until 1855, when Joseph Clapham took over." Book -Carman Arthur H, 1982 (reprint) Tawa Flat and the Old Porirua Road, 1840-1955 p71. Editor note: McKain was not the first Bush licensee. John Lodge and Anthony Wall held licences prior to him. However, the fact McKain held a Bush Licence during those times is correct. 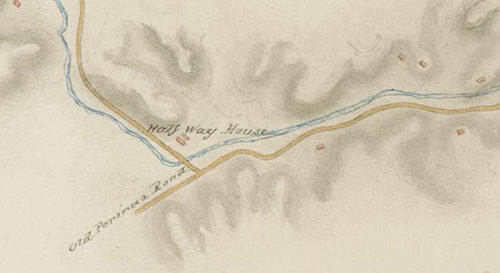 The Halfway House marked on an 1849 map signed by Captain A. H. Russell. Map drawn by surveyor Thomas Henry Fitzgerald. This map was to show the route of the new, upgraded road between Wellington and Porirua. The "Old Porirua Road" was renamed Stebbings Road after the Stebbings came to live there in 1863 and the first part of was later renamed Glenside Road, after Glenside became part of Wellington City Council in 1973. Editor note: Captain Russell's map shows the Halfway House on Section 23, and on the site/area of the existing Halfway House at 246 Middleton Road. The Wall family surmise that after the Wall's sold in 1849, the Halfway House operated from Section 23, not from the Wall's home on Section 24. The 9 February 1850 jury list shows John Ward McKain as a publican with a hotel on the Porirua Road. This hotel was known as Halfway House as it stood halfway between Wellington and Porirua. His Special Publicans License was Gazetted on 22 May 1850. In August 1853 John Ward McKain leaves New Zealand for the gold diggings in Australia, returning in 1855. The Ngauranga Road Assn. meet regularly at McKain’s Halfway House to progress the building of the Ngauranga Gorge road as an alternative to the Kaiwharawhara Road. The Gorge road is completed in 1859. Joseph Clapham takes over the McKain Halfway House. William Thomas Clapham succeeds Joseph Clapham. William and Elizabeth Edward advertise accommodation in the Wellington Almanack from 1866 to 1868 at Edwards Hotel, Half-way House, Porirua Road - noted for its "excellent quality of its Wines, Spirits and Ales, as well as for the comfortable accommodation it affords to travellers. Good stabling." Alexander Sandy Brown and wife Margaret arrive at The Halfway from Dunedin and manage an accommodation house and stables. Brown is a recognised good horseman. He introduced the double shaft wagon to New Zealand. A new Halfway House built by Brown. Brown leaves in 1890 for Hawera, dies at the age of 67 in 1900 and is buried in Johnsonville. The new Halfway House is known by the name "Gowan Bank". Editor note:The internet (Gowan name meaning) informs us that Gowan is from a Gaelic word meaning "iron worker" or "metal worker" and is from the Gaelic 'Govha' meaning a blacksmith. This is interesting when considering The Halfway was a coach stop for resting horses. Presumably there was a blacksmith. Gowan also refers to a yellow or white field daisy. The book "A Topographical Dictionary of Scotland" (1846), pp. 586-588 describes a village called Gowan Bank in the parish of St Vigean's, County Forfar. No link has been yet been established between the Brown's, who were Scots, and this village. Also of interest is the May family of Peterhead, Scotland, who came to live at The Halfway in 1886. Their daughter Barbara Henderson May married Thomson Bruce (also from Peterhead, Scotland) in 1894 and moved to Paremata and called her new home "Gowanbrae". Dymocks Ltd use the land for holding stock. Two families live in The Halfway House. One is John Pender who worked with stock, looked after horses and changed horses for the coaches and the other family were the Slater's, who operated a business in Johnsonville. The Pender's lived downstairs and the Slater's lived upstairs. "On a trip to England in 1908. C.H. Izard, of Wellington, purchased the property from the absentee owners - two maiden ladies - and leased it to Mr Scott, who ran a pig-farm. Mr Jillet, of Titahi Bay, succeeded him, and then Mssrs Dymocks Ltd, purchased the property for stock, Mr Pender, senior, being a caretaker."